I LOVE cinnamon rolls! They may be my favorite thing… ever! When I saw this recipe from, Picky Palate, I knew I HAD to make them! These. are. INCREDIBLE! Hands down one of my favorite cookies! If you are looking for a treat to completely “Wow” your guests, then this is the recipe! Whenever I make them, they are the first thing to disappear… and I am sure they will be at your house or party, too! These look perfectly delicious! I love pinterest! OH,,,,can't wait to try this. Making a copy of it now! I love the look of these cookies! YUM!! These look amazing and I love how unique they are - can't wait to try making them. Thanks for sharing the recipe. Oh my gosh, these look delicious! I want to make them today! So do they harden like cookies do? Or do they stay soft? Would I have to use that sugar cookie recipe or do you think the pre-made sugar cookie dough from the store would work? I'm lazy... ha ha! Thanks for sharing! Oh yum!!! Those look great. Thanks for the comment and the follow! Gonna go follow you, now! Mmm, looks like a recipe worth making over and over again. What a neat recipe. I love your blog and signed up as your newest follower and then opened my email to find out you had done the same :). These are going on my "must try" list immediately! these look so yummy too! thanks for the follow! i'm following back as well! Wow this is one I think even I can make!Thanks I am a new follower. OOHH These are so delicious! I love baking too! Thanks for the follow- returning the favor! Great food here- now I'm hungry! Oh wow! Just printed this one out...my teenage daughter is going to LOVE these! Ha! I have a recipe that I am making on the kids first day of school. Your's look great. OMG these look A-M-Azing. I am going to have to make this week for sure. I am following you back thank you so much for checking out my blog. I will be checking your recipes daily. I am a huge baker and i love to cook. Oooh these look delicious! Nom nom nom. Am following back from the hop! Returning the hop comment - now following too. Great recipes here - I'm very inspired as I'm a novice cook and just finding the enthusiasm in my 40th year on this planet. Yes, I'm a late starter!! *Drool, drool* If they taste as good as they look then I am in trouble!! I can't wait to make these! And loved your pictures!! Oh my heck!!! pinned it! So gonna make these!!! those look amazing ! you should come check out the delish dishes i've been whipping up! I’m definitely a cookie person, so this sounds delectable! Thanks for sharing! Put you on FB, Pinterest and Twitter! :) Thanks for linking!! I would love to wake up to those tomorrow morning. They look amazing. Just wanted to know I saw these on Lil Luna's link party and made them for a party. Everyone wants the recipe, cause they were awesome! Those look like the real deal! I love the frosting! Would it be bad to eat these for breakfast? I can't wait to try these! Nikki... how many times am I going to feature you girl? You made it again. I'll be featuring you tomorrow during STICKER TIME! I need to pin this b/c I NEED to make these ASAP, oh my word, maybe I shouldn't....no I will!! You have the most amazing recipes. I'm doing the cinnamon roll cookies this morning. Can't wait to try another recipe from your wonderful selection! Thank you! I love cinnamon rolls and I love cookies! What a great combination and they look so elegant, too! I'm with you - I love cinnamon rolls!! These look divine and I must make them. why do you need to put the cookies in the refrigerator? There does not appear to be anything that needs long-term refrigeration, Is it to set the icing? Oh my! 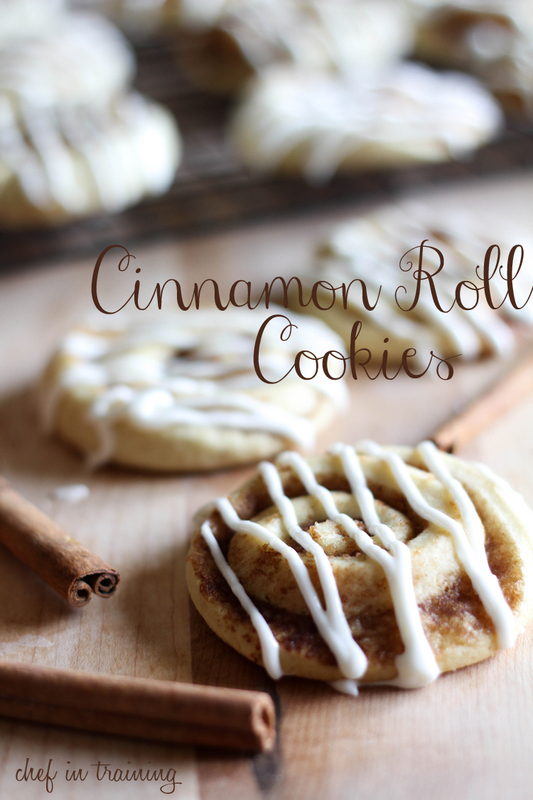 Not that I need another reason to eat cinnamon lol, but I will be pinning this recipe none the less! I am visiting via Riches to Rags! amazing receipes for the holidays... looks really delicious too!!! I can't wait to try but I have a question. When you list multiple ingredients and say add slowly, do you mean add each one slowly individually in that order or mix the list together and then add the mixture slowly? I feel silly asking, but I really want these to turn out right. Hi Christy! You mix the dry ingredients together first then slowly add the mixture in slowly. With the frosting, the reason for the slowly add ingredients is to make sure you get it to you desired consistency. You can just watch it more closely that way :) Let me know if you have anymore questions. I'm happy to answer them. These look yummy and adorable! Can't wait to make them. Trying out some new cookie recipes this winter :) Found your blog via pintrest. Looks neat - great pictures! Hey there! (: I love cinnamon rolls! I just made the dough and was wondering now , if it's supposed to be that sticky?! I already put more flour in it, but I'm not sure, if I'll be able to roll it out. Putting it in the fridge for a couple hours helps to manage the stickiness when it come to rolling it out. Also when it come to rolling it out, make sure you flour the surface and rolling pin well. Thank you, I'll try that and hope that they'll still turn out as good as they look in your picture! (: Love your blog! cinnamon roll cake is the best I have ever had!